PDF Merge from SysInfoTools is a powerful utility designed to manage PDF files. This tool allows you to merge any number of PDF files into single PDF file. Easy to use and safe to install tool, with highly interactive graphical user interface. PDF Merge from SysInfoTools is a powerful utility designed to manage PDF files. This tool allows you to merge any number of PDF files into single PDF file. Easy to use and safe to install tool, with highly interactive graphical user interface. PDF Merge from SysInfoTools, supports popular image formats: TIFF, BMP, JPEG, GIF, WMF, PPM, EMF, DIB, DCX and many more. 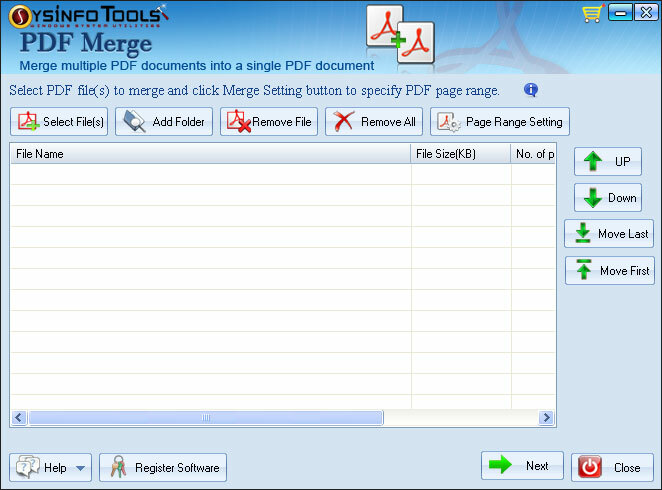 PDF Merge from SysInfoTools is a stand-alone application. EML File to PST Converter Software effectively convert EML file to PST in few easy steps. This conversion tool also supports all Outlook versions - Outlook 2010, Outlook 2007, Outlook 2003, and Outlook 2000. Wise File Restore Freeware is recommended by many users. They said Wise File Restore Freeware has powerful functions and it's easy to use. Do you want to know more about it? Just after reading the article, you will get to know why people like it! Are you looking for Multiple VCF to Excel solution? Try the SoftSpire VCF to Excel Converter tol to convert and import VCF files MS Excel File. VCF to Excel Converter is a well known tool to convert single as well as multiple VCF to Excel files. Smart Print Spooler Not Running Fixer Pro is recommended by many experts and users as the best Print Spooler fixer. It can not only fix Print Spooler but also other, if you want to know what are they you can have a try! Export Zimbra Contacts to applications like Outlook, Excel, GMAIL, Windows Live Mail, Lotus Notes, etc. using the top-notch Zimbra Contacts Converter.